Join us for all new releases of your Les Mills favorites - plus guest Les Mills National Presenter will join us for a special BodyJam/Sh'Bam class! Get the schedule here! You can view the new Group Fitness schedule here. License to Train is a program to provide a 10-11 year-old the proper instruction and orientation to exercise. Learn more! Our course teaches CPR/AED for the professional rescuer, first aid, professionalism, patron and facility surveillance, rescue techniques, emergency preparedness and more. Learn more! Drop your kids off for a night of fun! 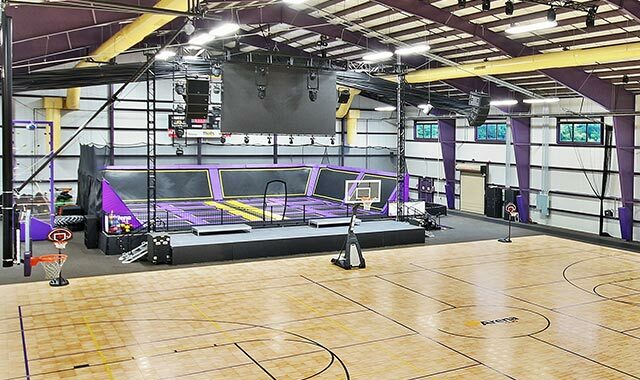 Children will enjoy the trampoline, sports on the Sport Court, swimming, and having fun with friends. Learn more! Get better this off season! We have a state of the art facility that you have full access to, in order to get your game to the next level. Learn more! Our Swim School is structured to provide a safe and nurturing aquatics experience for all students. Learn more! Our co-ed soccer clinics offer more focused instruction through organized drills taught by experienced instructors. Learn more! The Summer Starz is a Harford County Swim League. The team is open to all swimmers 5-18 years old who can swim a length of the pool backstroke and freestyle. The season runs from the end of May through July, with daily practices and nine meets. Learn more!